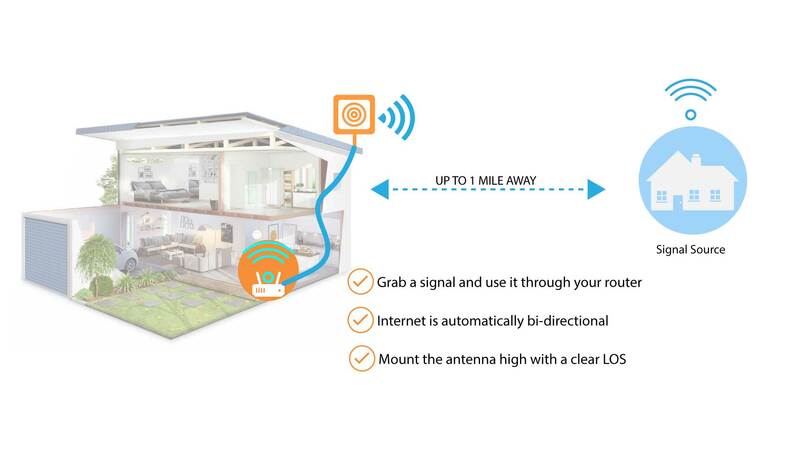 In order to have a successful long range WiFi link, you will need to meet 3 basic requirements. While not every case is the same and some times you may be able to get away with compensating on one requirement over the other, you will need to be aware of the factors at play for a long range link. WiFi as we know it works on the 2.4GHz and 5GHz frequencies. Each frequency has their own advantage and disadvantage but for the most part you should focus on boosting your 2.4GHz signal. The 2.4GHz signal is what all 99% of all global WiFi devices are compatible with unless you specifically buy one on another frequency. This means that your phones, computers, smart TV's, game consoles, tablets and more are all able to connect to the internet via this frequency. A successful long range WiFi connection needs a WiFi radio commonly known as a WiFi repeater. The WiFi repeater is responsible for "wirelessly bridging between the signal source and your router. Contrary to popular belief, your router alone will not make this happen, you need a separate device between the antenna and router for it to work. You are creating a "Wireless Bridge"
Antennas come in different sizes and shapes and can be used indoors or outdoors. 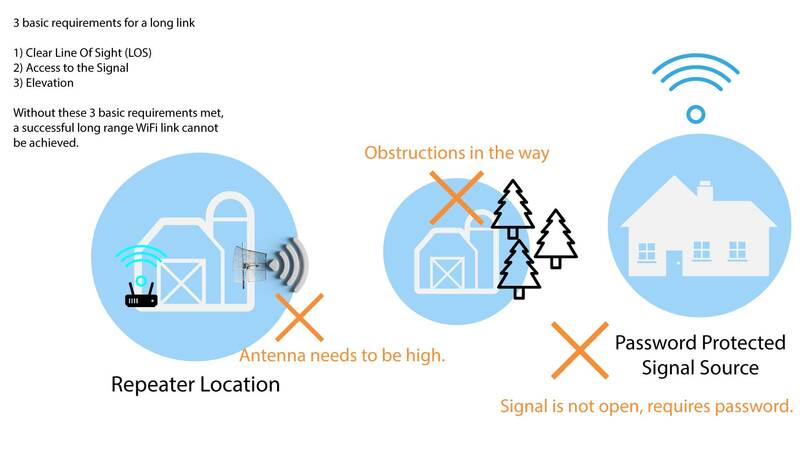 Most antennas have one specific feature that separates them from the other, but for the most part WiFi antennas can work effectively in about 75% of all applications. What's important to note is the two big differences that determine what an antenna can do and how it will perform. 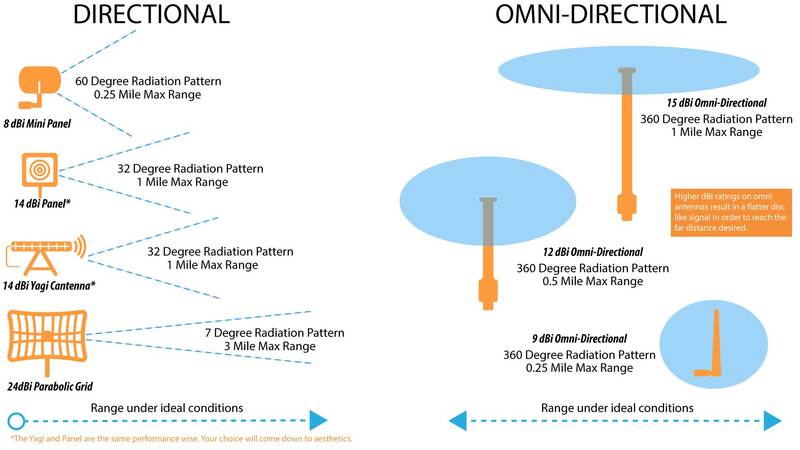 When choosing a WiFi antenna you want to know if you need an omni-directional antenna or a directional antenna. The difference can work in your favor when used appropriately. The higher the dBi (GAIN) the further it will reach. It will accomplish this by changing the radiation pattern on the antenna. 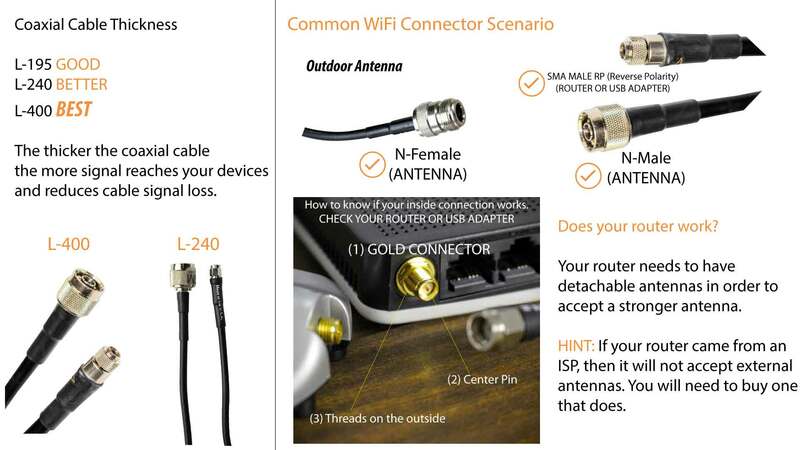 WiFi cable connections occurs over one of two options, either coaxial cable or Ethernet cable. The two cannot be interchanged and each has a very specific use. To begin learning what connection you will need/be able to use, you must first understand that Ethernet cable is used to connect two devices while coaxial cable is used to connect a device to an antenna. When to use Ethernet cable: Ethernet cable has come great advantages over coax. For starters it is much cheaper and has a much lower attenuation rate (signal loss) over coax. You can run up to 328 feet of CAT 5 Ethernet cable (the most common type found) before experiencing any loss in performance. Ethernet cable is fantastic for high speed internet transfers between two devices. Examples include a router to a PC, a router to another router or a router to an access point. You will not be able to convert an Ethernet connection to a coaxial connection without some sort of "radio" in between. Coaxial cable connections: A coax connection occurs whenever there is a radio frequency involved which is why coaxial connections involve antennas 99% of the time. A common scenario would be to use a router with a coaxial cable outside connected to an antenna in order to share your signal outdoors. As a rule of thumb you always want to go with the shortest cable length and thickest cable type possible. After reading this helpful guide to WiFi antennas, you are now on your way to becoming a networking guru! Feel free to contact us if you have any questions by calling or sending an email to Support@SimpleWiFi.com.